Ready to unleash your inner animal and give this ballsy workout a try?? Can't stop yourself from drumming along to your favorite song on the car radio? Or looking for a workout that's so fun it doesn't feel like a workout? 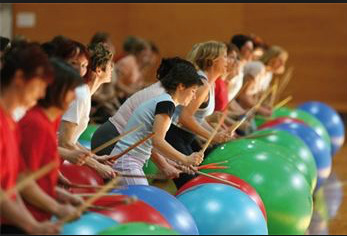 Cardio-Drumming is the one workout that really ROCKS! This full body cardio jam session combines light resistance training (utilizing weighted drum sticks) with constant simulated drumming. This all levels class torches those calories while toning up and rockin' out. If you can hold drumsticks, YOU CAN DO Cardio-Drumming. Whether you're a fitness newbie or long-time gym expert, you will drum, jump, pound, twist, and squat through an awesome playlist of old school funk, upbeat current jams and rocking tunes that will make you feel re-energized and just plain happy. Modifications provided to meet your fitness level. Music: <br>Shake your groove thing to retro pop hits from the '70's and '80's. Equipment required: 65 cm. fitness ball, 17 gal. plastic tub, and a set of drumsticks.